Every once in a while, a new brand comes along that causes a storm in the Swiss watch industry. One such brand is HYT. 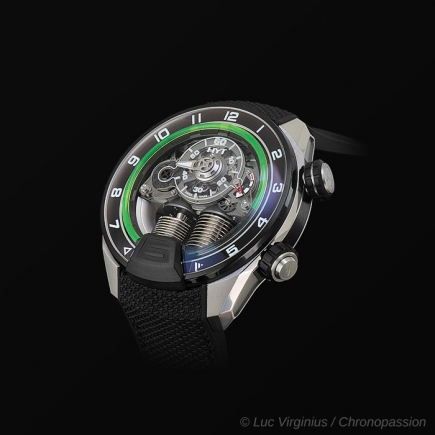 HYT isn’t just another watch manufacture. Born from a multi-disciplinary team whose expertise reach far beyond the confines of traditional Swiss watchmaking, HYT is exploring uncharted territory with its hydro mechanical watches, where the notion that “time is fluid” takes on a literal sense. While the idea to use a liquid to indicate the time in a mechanical watch is novel and unheard of before HYT watches came along, the idea of using fluids to indicate time is actually ancient. 3,400 years ago, the ancient Egyptians invented the clepsydras or water clock. These water clocks transported water from one container to another to measure elapsed or time. Fast-forward to the present time and you have HYT, the hydro-mechanical watchmaking brand. Established in 2012 in the Swiss watchmaking region of Neuchatel, HYT is as much a watch brand as it is a creative laboratory, pushing beyond the limits of traditional watchmaking with its own developed technology and tools. At the core of every HYT watch, starting from the very first H1 series launched in 2012 is a liquid display of the hours to indicate time as it passes. Housed within its large, round satin finished case in titanium, black DLC titanium or rose gold is a captivating hydro mechanical display of the time on the avant-garde watches. A glass capillary tube surrounds entire dial, and within it a colored liquid slowly fills it up during the time of one hour. Using a system of two miniature bellows, there are in fact two different liquids in the glass capillary. One is a colored liquid, which indicates the elapsed time, while the other is completely transparent. The meniscus between the two liquids gives the current hour, while a traditional minute hand is used to read the minutes of that hour. Every 12 hours, once the colored liquid has reached the 6 o’clock mark, the bellows absorb the colored liquid back into the reservoir while pushing the transparent liquid out so as to restart the 12-hour retrograde cycle of the fluids on the dial display. Achieving this hydro mechanical way to indicate time is, of course, no easy feat for the brand HYT, especially when using a mechanical movement as the engine. Working with liquids on such a small scale while maintaining precision and longevity required several innovative solutions on the cutting-edge of technology. For one thing, the liquids must be of very specific properties to achieve the right kind of fluid motion. The same applies to the capillary glass tube that the liquids move through, with special coatings on the interior to ensure a perfectly fluid motion with no liquid residues left behind on the time display of the watch. And since liquids are far more sensitive to changes in pressure and temperature than solids, the bellows contain thermo-compensation mechanisms so that the liquid hour display is always on the correct point. 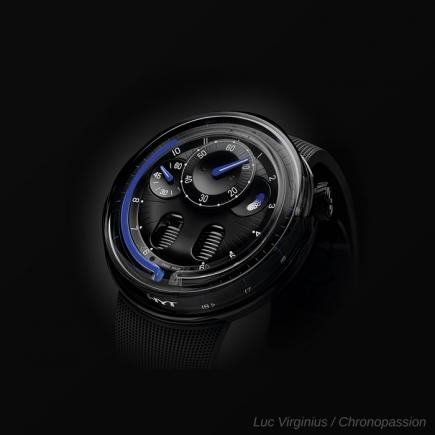 The manual winding movement of the H1, which was co-developed between HYT and Jean-François Mojon of Chronode, features a mix of innovative features within a more traditional Haute Horlogerie execution. On the case back, the bridges of the HYT H1 and the later H0 movements are decorated with côtes de Genève stripes and beveled edges. The movement provides a power reserve of 65 hours when fully wound, with a power reserve display on the dial in the form of a disk or pointer hand. 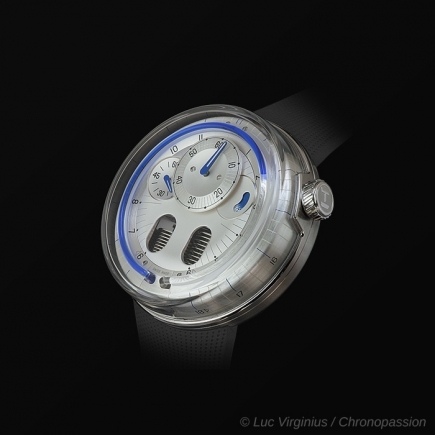 HYT has explored different expressions of fluid time with its creations. 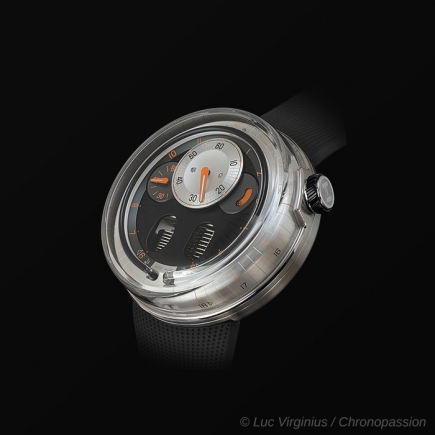 The brand came out with the H2 watch in 2013 with the same liquid time display as the first H1watch, but in a much more dramatic fashion. The movement, co-developed Renaud et Papi, features a balance wheel on the dial side of the display, a central minute hand and inclined v-shaped bellows for a clear view of how the hydro mechanical HYT time display system works. Playing with the hydro mechanical display in more artistic and even philosophical ways, HYT introduced a number of watches in the past few years that have become emblematic of the hydro mechanical watchmaker brand. This includes the Skull collection that foregoes the minute hand and focuses only on the liquid hour display, surrounding an oversized central skull with a futuristic design. So outstanding, the HYT Skull was even adopted by the one and only Axl Rose of Guns N’ Roses. 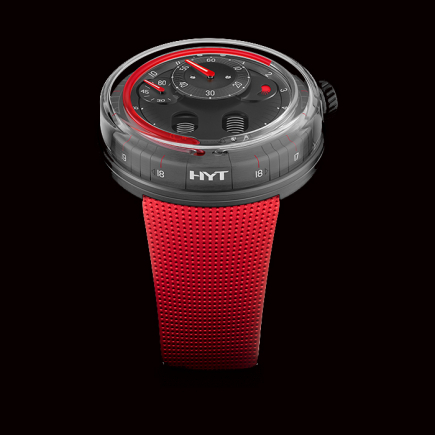 The introduction of the HYT brand H0 collection marked a turning point for the HYT brand, with more three-dimensional volumes and organic forms for their hydro mechanical liquid time display watches. The base of the watch case is in Titanium or Gold, while the side and top is a single sapphire crystal “glass box” component, allowing a side view of the capillary of the liquid time display and even allowing additional indications. 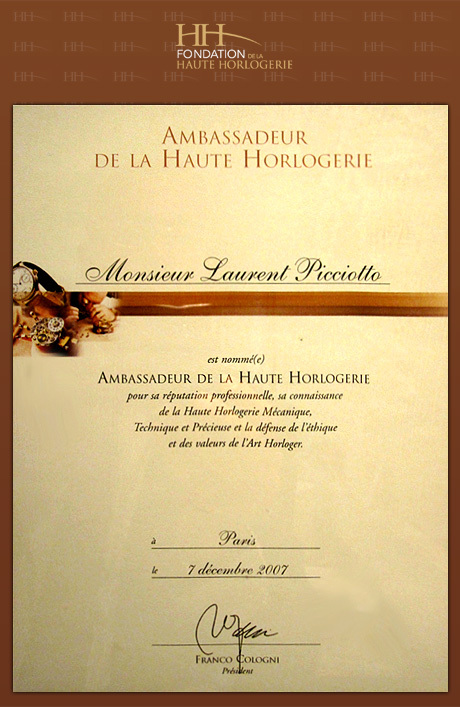 The same treatment has been applied with the H1 and H2 movement to give us the H1.0 and H20 collection of hydro-mechanical watches. There are no lugs attached to the case. Instead, the strap attached directly to the pebble shape case for a more ergonomic experience on the wrist. 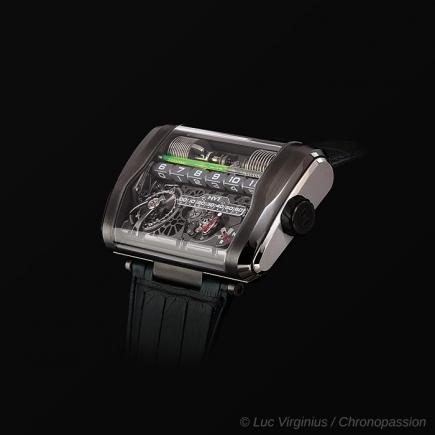 Chronopassion is an AUTHORIZED RETAILER of HYT since 2012, date of the brand's birth.